Do you gums bleed when you bite into something hard, or when you brush your teeth? 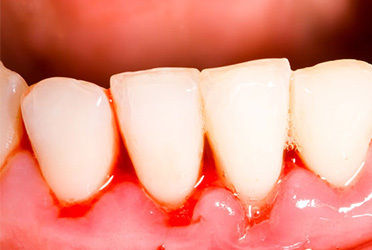 Bleeding gums are indeed a cause of worry, as they are an indication of gum disease. You have to give as much importance to your gums, as much as you give to your pearly whites. Healthy gums play an important role in maintaining good oral health. Bleeding gums may also be sometimes associated with loosening of teeth, bad breath, inflamed and swollen gums, and rarely formation of pus around the gums. The gums may be tender when touched. Triphala tea is an effective Ayurvedic cure for bleeding gums and gingivitis. Given, the astringent properties of the herb, it is effective in arresting the bleeding. Therefore, gargling mouth with triphala tea would be helpful for bleeding gums and gingivitis. Ayurveda recommends Nyasa treatment, depending on the dominance of the dosha. If vata is badly damaged, then Triphalaghrita may be used for the treatment, and if it is a pitta dominance, Yashtimadhu may be used. Gargle with sesame oil to beautify your teeth and gums. Warm, organic, unrefined sesame oil works best. Just hold it in your mouth for a minute and expel it. Just apply some oil to your index finger and gently massage your gums. This process (known as oil pulling) is also helps in preventing cavities and receding gums and is the best remedy for bleeding gums. Licorice helps in cleansing the mouth, improves secretions in the gastrointestinal tract and promotes salivation. Chewing on licorice root will help in getting a clean mouth and arresting tooth decay. Apply crushed jamun leaves and guauva leaves to reduce bleeding of gums. You can also chew on these leaves to keep your gums strong. Make a mixture of ixora and hibiscus flowers along with Yashtimadhu (licorice) powder. Make a smooth paste by adding water, and apply the paste to your gums. Leave it on for 30 minutes. This will not just help in reducing bleeding, but it also strengthens your gums. Take some honey on your fingertips and massage gently. The antibacterial and anti-inflammatory properties of honey help in killing bacteria which would have caused bleeding gums. However, this should be done regularly. A similar massage with coconut oil also helps in strengthening gums. Eating a raw apple half an hour after a meal can help in keeping the teeth clean and healing the gums too. Mix salt in half a teaspoon of mustard oil. Use this as an ointment and massage the teeth and gums. Repeat three or four times a day to see the difference. This also helps reduce bad breath. Turmeric has great therapeutic values, and is popular in healing infections. The presence of curcumin compound in turmeric makes it a great anti-inflammatory and anti-microbial, which helps prevent bleeding gums. You just have to mix in a pinch of turmeric with mustard oil and massage gently on your gums. Alternatively, dip a small cotton ball in a bowl of ice cold water, add a pinch of turmeric on the cotton and place it on your gums. Use a toothbrush with soft bristles, if you have bleeding gums. Ensure that you brush your teeth twice a day. Scraping your tongue is equally important. It is good to do a salt water rinse, as salt has anti-inflammatory and antiseptic properties. It reduces the swelling and fights infections that lead to bleeding gums. Clove oil helps in reducing inflammation of gum and arrest bleeding to a great extent. Make it a habit to rub in a little clove oil on your gums. Else, just chew on one or two cloves. Foods like soy and garlic can help in keeping your gums healthy. Chewing raw vegetables can improve blood circulation in the gums and keep them healthy. If you are vitamin-deficient, begin taking supplements daily.